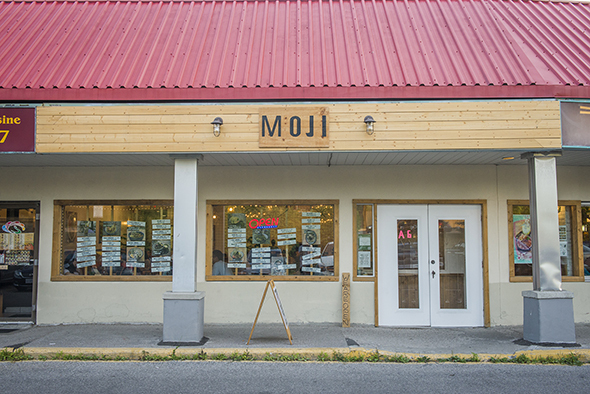 Moji is an Asian-fusion restaurant at New Kennedy Square mall . It's easy to spot - it's the only restaurant with wooden exterior window frames when you drive across the parking lot. Most of the restaurants that dot this rather ugly mall are traditional Asian restaurants. Moji is one of the exceptions to this rule. 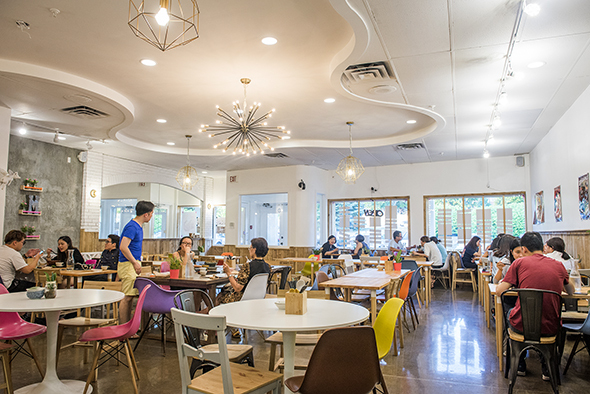 It's spacious and modern, with its interior sporting a hodgepodge of vintage and quirky from nautical ropes to brightly coloured, mismatched chairs. 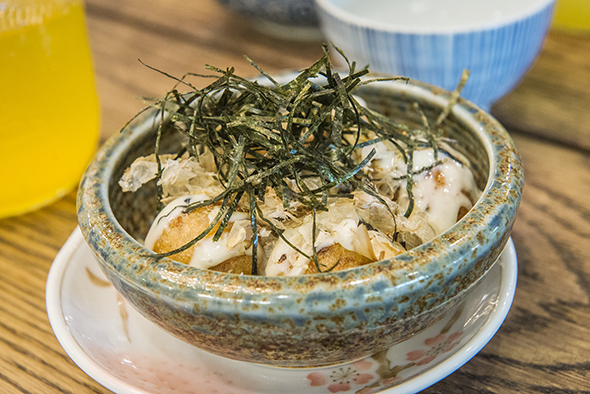 The food here is predominantly a modern take on Japanese favourites. For example, takoyaki is served here in several different ways, with the Cheese Takoyaki ($5.95) being my pick of the bunch. And yes, cheese really DOES make everything better. 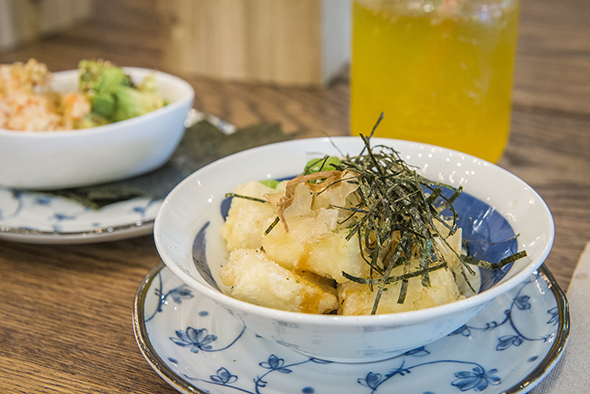 The Agedashi Tofu ($3.80) and Lobster Salad ($3.95) are also on point. 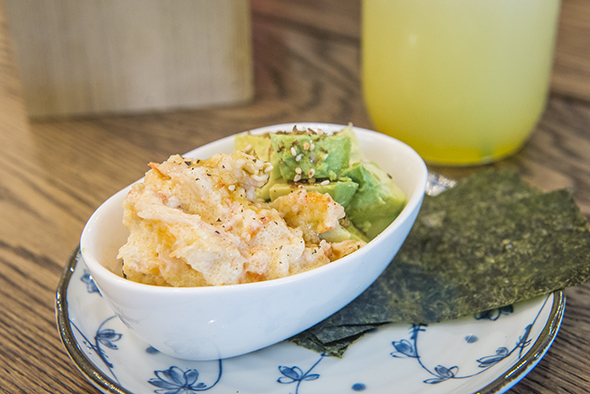 The velvety smooth lobster comes with a slightly spicy sauce while the tofu is your standard Japanese-style deep-fried tofu, albeit one that is done well and seasoned nicely. 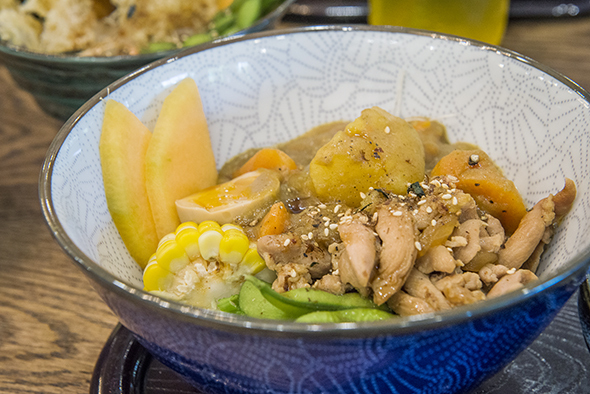 Japanese rice bowls make up most of that main dishes. 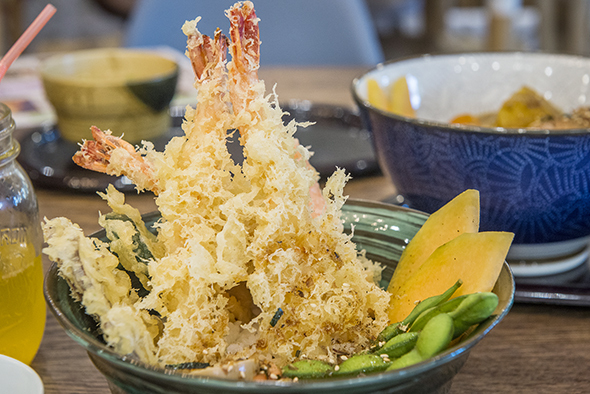 The Seafood Tempura Rice ($11.95) are delicately fried prawns, crab meat and squid served on a bed of warm rice and served with a side of tempura dipping sauce. It's not greasy and massively satisfying. The Unagi Rice ($11.95) is another fave. The eel is grilled and seasoned very well, and the meat is just the right thickness. The sauce isn't overly sweet either, a problem I have encountered at other places. The Spicy Buta Mayo Rice ($9.75) might just be my favourite thing on the menu. 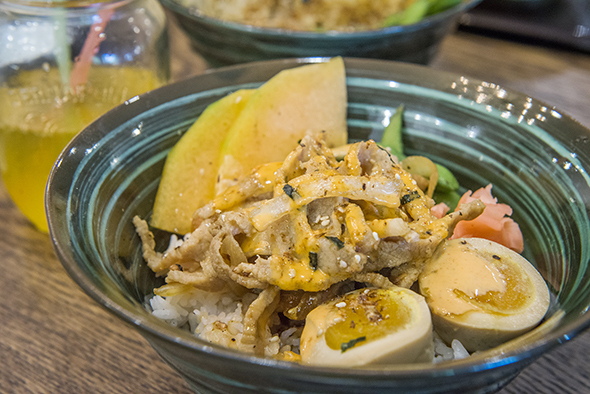 Tender cuts of seasoned pork cheek are accompanied by a drizzle of spicy Japanese mayo on a bowl of rice. The beef in the Gyu Rice ($8.50) is insanely tender, but I wish there was a bit more marinade. Regardless, it's on par with the better Japanese donburis out there. Make sure to order some of their signature drinks too. 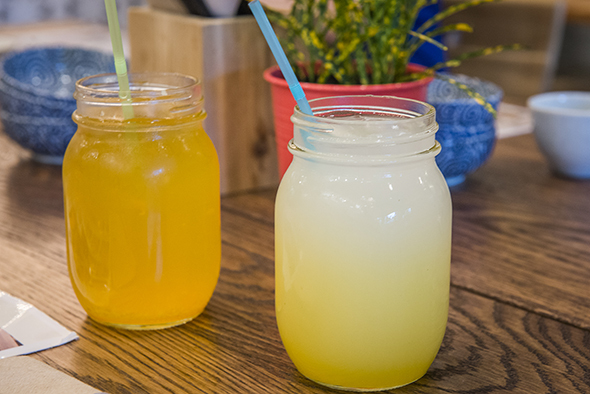 The Iced Peach Calpis ($3.90) is fruity and creamy from the yogurt while the Iced Passionfruit Ginger Tea ($4.00) is immensely refreshing, with lots of pulp and a subtle ginger kick. Moji is also home to some fantastic-looking desserts. 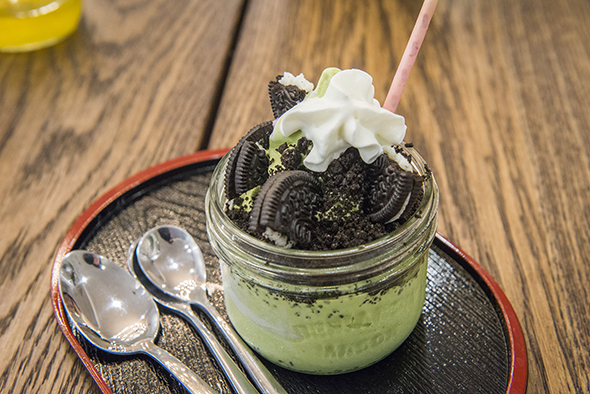 The Oreo Ice Cream ($4.00) comes with Oreos crushed into an ice cream flavour of your choice (ours being a twist of matcha and taro). 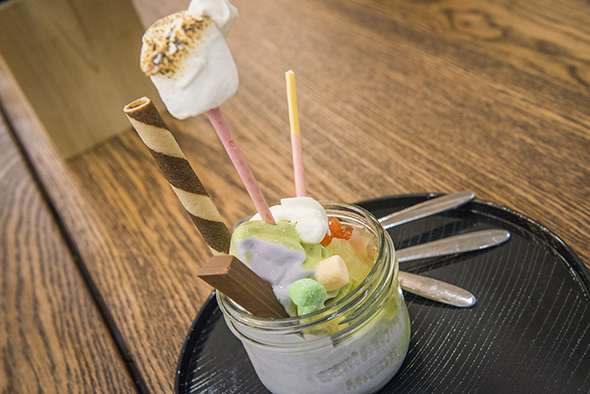 A similar ice cream base is also used for the frankly ridiculously awesome Twist Parfait ($6.00), which throws Pocky sticks, a roasted marshmallow, a Kit Kat bar, candies, and popping boba into the equation.